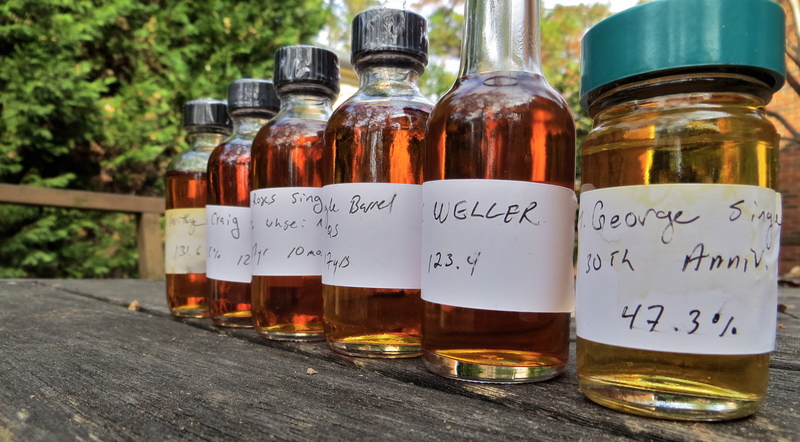 What is one to do when a friend sends samples of six rare whiskies? Savor just one at a time, patiently focusing on one a night? Or line ’em up, compare and contrast, push and prod (and yes, savor, too)? I chose the latter, and it made for an epic tasting night. I won’t go into great detail here on the backstory of each of these whiskies – for the most part, these are not bourbons you are going to find on the shelf of your local store – some were direct from the distilleries’ gift shops, some are limited releases that barely see the shelf, and one is a very special release celebrating the 30th anniversary of one of America’s leading craft distillers. I (almost) feel bad even talking about them, since there’s not much you can do other than to make a mental note in case you ever come across one of these bottles. In addition to the samples pictured above, I also threw in two comparison bottles – good old Pappy Van Winkle 15 year old (bottled in 2008) and a last year’s version of the William Larue Weller, just to see how these samples stacked up against two proven bourbons. The bourbon of the night – this William Larue Weller came across as a class above, with a nose that sings with power, citrus in the background keeping it real. It is STRONG but in balance. Staggeringly good bourbon of the highest degree. Showing even better now than it did when I first opened this bottle last year. This is an incredibly unique whiskey, and one that stands apart from any bourbon as a wholly different animal. The nose is that of an aged riesling auslese (seriously, if you told me this was an old riesling, I would have believed you), floral, nutty and sweet, with a prominent note of pears. The pear brandy barrel aging dominates here (in a very good way), like a great caramel pear dessert. Unique and delightful. This Four Roses is very refined, with a somewhat shy nose, but one that speaks of elegance and harmony. There’s a bit of wood here, but baking bread comes to the fore, subtle candied orange, floral notes, and a fruity sweetness that holds the heat in check. This is pretty, lively stuff, not nearly as powerful as the Weller mentioned above, but almost as impressive in its own way. Beautiful. This one outperformed expectations, even though I am a fan of Elijah Craig. Heavy spice and gingerbread on the nose. With some water, the caramel and orange notes emerge more strongly. Deep brown sugar/caramel, the strength is well integrated, and with water (again) becomes velvety smooth and thick. This is a prototypical/textbook great bourbon. Very impressed. Well, Pappy didn’t win on this night, but still showed well. Not dissimilar to the ’11 Weller, this Pappy showed a darker, deeper harmony, but didn’t reach the same heights. A notch below the previous whiskies, the 2012 Parker’s has a hot, cinnamon nose that is dominated by the heat of its barrel proof. Candied apples and a fruity profile set it apart, though, as a nice bridge between sweet and spicy. The 2012 did not show nearly as well as the 2011, with a more muted nose. Sweeter up front, and sharper through the finish than the 2011. Water brings it into balance, but this simply did not compare to the 2011 version. Still good, but not up to expectations. Maybe the most disappointing sip of the night, this one felt a bit tired, with a much more muted nose and an herbal/cough-drop quality. It starts out very smooth, with mint and fruit notes, but the finish is hot and tannic. Too much time in the wood? 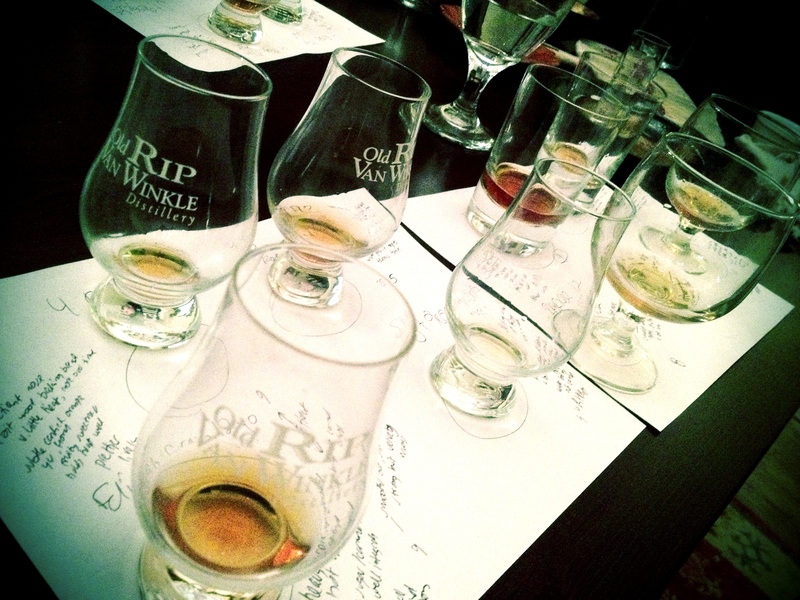 So, an epic tasting night. Some amazingly good and rare whiskey. Thanks especially to Jason at Sour Mash Manifesto for his generosity. Great recap! You beat me to it. Thanks for sharing these great bourbons with me. A good time. Learned a bit, too. That’s a helluva night. Wondering if you tasted at bottle strength, or leveled the playing field? Brent, we started everything at bottle strength (which was a big range, from 95-134 proof) to get an initial read. Then, we also tasted everything with a few drops of water or a bit more based on judgement (not measured to get to an exact watered down proof) to gauge any changes. The ’11 Weller handled its high proof very well, whereas the ’12 Weller benefitted more from water even at a lower initial proof. The Parker and Elijah Craig also clearly benefitted from a bit of water. The 4 Roses 13 yo showed great neat at 126 proof. Just snagged a bottle of 14 year OBSK at 62% from warehouse 16-4g bottled Dec 2012. Can’t wait to pop it open now after reading your review. Nice! I’m sure you’ll enjoy it. How do you come across such goodness? I am born and raised in Kentucky. I live in Kentucky and for years had the benefit of 30 dollar bottles of Elmer T Lee. The bourbon I had stock piles of up until what I call the Hollywood society discovered this gem after the great man’s death. Now it’s the 2nd coming of Van Winkle. You can’t find it anywhere and if you do its 80 a bottle or more. How do I find legit connections? My kentucky heritage runs deep so much so I won’t spend money on whiskey made anywhere else in the world outside the rare single malt scotch. I want to know why these bourbon distilleries in kentucky have always had loyal kentucky folk buying only their products yet all the Van Winkle, Antique Collections, and now Elmer T Lee is being sent to Chicago, New York and LA. I love these liquids and the rich history of Kentucky bourbon.. money isn’t an issue for me.. but where is the love? It sure as hell isnt being returned. No where in Kentucky should be out of every single drop of Buffalo Trace products yet they are. I want my weekly bottle of Elmer T Lee. Something tells me Lee in particular if he were still with us wouldn’t let this sort of abuse take part on his fellow Kentucky natives.